Are The Raptors The Real Deal? Toronto Raptors have consistently been near the top of the Eastern Conference this campaign but will their wait for a maiden Championship finally end? The Raptors are yet to win the NBA Championship since their franchise started in 1995, with only five division titles to show for their steady progression. These titles have come in 2007, 2014, 2015, 2016 and 2018. But 2019 is showing signs that they are about to break new ground, but why? Kawhi Leonard has quickly adjusted to life in Toronto, despite it not being his first choice of destination. Undoubtedly his quality is there. He has been among the top five players in the league for the past five years. Leonard is turning into the game changer that could deliver the Championship; which is turn would him immortalised forever within the hearts of the Raptors fans. He has a history with capturing glory. Who could forget when he outshone LeBron James in the 2014 series as Miami Heat fell to the San Antonio Spurs? It is the Raptors that are utilising Leonard the way that he needs to be. He is returning the favour by giving MVP numbers on a gamely basis. That being said, they can also perform without him. Just look at their win over the Golden State Warriors in December; Leonard was missing, and Kyle Lowry picked up the mantle. Raptors won that fixture by a 20 point margin, but Lowry was undoubtedly the star of the show. Lowry is having an excellent season; averaging 14 points and ten assists a game, and with Leonard sidelined he made his mark on the team. 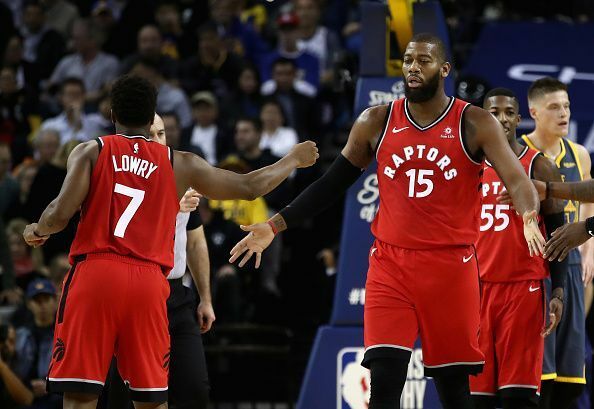 For the visit of the Warriors, Lowry recorded 23 points and produced 12 assists. Furthermore, he was directly involved in 49 of the Raptors’ 113 points. Serge Ibaka is also becoming another player that is vital for the Raptors success; in the same game against the Warriors he netted 20 points and added 12 rebounds. Ibaka is averaging 17 points per game. The game against the Warriors highlights the strength that the Raptors have, even without Leonard. Let’s not forget they dismantled one of the best sides in the NBA by over 20 points. Another player that has seen the Raptors become the real deal is Pascal Siakam, the primary defensive player was drafted at #27 back in 2016; but he has now come alive as an offensive threat, primarily down to his size and athletic ability. Siakam is averaging over 15 points per game this campaign, with his progression a clear advantage for the Canadian side. He is ensuring that they can get a high standard of production from PF. Danny Green, who was a by-product of the Demar DeRozan- Leonard trade, has also turned out to be a significant contributor for the Raptors. He has been a star as the knockdown shooter, while also boasting an impressive 45% from the field goal position. The importance of having a shooter of this calibre in their side has been invaluable. It enables the Raptors to look threatening from everywhere on the court. It’s no surprise that the Toronto Raptors are among the favourites for the NBA Championship when you consider the quality on the court, but that’s not forgetting that they also have one of the best coaches in the NBA. With Nick Nurse they have management that will continue to bring the best out of his players, making an NBA triumph a real possibility.